Photovoltaic Solar Energy Modular Trainer "MINI-EESF" is a laboratory scaled unit designed to study all the parameters involved in the solar radiation direct conversion into electricity. The trainer is based on some application modules and photovoltaic solar panels assembled in mobile structures. It is specially designed for the theoretical and practical study of the electrical installations with photovoltaic solar energy, the typical configurations used in photovoltaic installations and the operation of the different elements involved in the conversion. The power obtained from the solar energy can be: Regulated to obtain a DC power to charge a battery, studying parameters such as solar module´s current output charge level, battery voltage, etc. Delivered to DC loads, studying parameters such as solar module´s current output and current consumption by the loads. Converted to AC power to be delivered to AC loads, studying parameters such as current consumption by the loads. Injected to the grid, studying parameters such simulated solar module´s current and voltage outputs, power injected to the grid, mains voltageand frequency, etc. Three different versions are available with different practical possibilities and levels of difficulty: MINI-EESF, MINI-EESF/M and MINI-EESF/B. Supply and Consumption at 12 V (DC). Supply and Consumption in alternating current (AC). Supply to the public network (grid). Solar Panel (polycrystalline) mounted on an anodized aluminum structure with wheels for mobility, and with calibrated cell to measure solar irradiation. It consists of 36 high performance photovoltaic cells (35 x 55 mm), with a typical power of 50Wp for a 17Vdc voltage. other adverse environmental factors protection. Voltage at maximum power point (Vmpp): 17.8 V.
Current at maximum power point (Impp): 3.70 A.
Short-circuit current (Isc): 4.05 A. Open circuit voltage (Voc): 22.25 V.
Dimensions: 660 x 35.5 x 780 mm. Weight: 3 Kg. approx. Battery offering optimal performance with low power applications. Capacity: 32Ah with 96 Wh per day. Anodized aluminum framework for modules allocation. consumption. It is provided with a diagnosis system to indicate the user the status by different flash sequences. ES40. AC Voltage measurements module until 250V. and DC until 250 V.
ES50. Loads module that incorporates two lamps of 220V. or 110V., 50 W., with independent switches. ES80. Module for measurements of solar irradiation (W/m2) and measurements of current until 10 A.
ES90. Module for 12Vdc battery charger. EE-KIT2. Grid Connection Inverter Kit. removed from the wall socket or the public grid fails in operation. The inverter can be connected to a PC through RS232 communication to display some parameters such as voltage and current inputs, mains voltage and frequency, maximum AC power, KWh, etc. Nominal power @ 25ºC: 535 W.
Maximum power @ 25ºC: 600 W.
Nom. rated current: 8 A.
Voltage: 85% 110% Un (195-253 V). Maximum power/fuse: 2.25 A / 3.15 A. 1.- Determination of the constituent material of the solar cell. 7.- Measurement of the solar energy. 8.- Measurement of the solar panel voltage with no load. 9.- Determination of the disposition of cells in a solar panel. 10.-Familiarisation with the regulator parameters. 11.-Loads connection to a 12 Volts DC. 12.-Loads connection to a 220 Volts AC. without illumination. 13.-Study of the grid utility inverter. Framework with modules: Dimensions: 1300 x 370 x 750 mm. approx. Photovoltaic module: Dimensions: 730 x 510 x 1150 mm. approx. 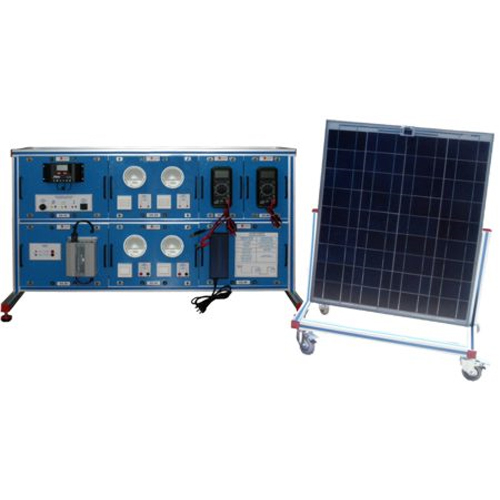 Grid Connection Inverter Kit: Dimensions: 490 x 330 x 410 mm. approx.